Man Proposes Using Weird Engagement Ring: Made with Bones from His Amputated Leg! - 2NGAW! Man Proposes Using Weird Engagement Ring: Made with Bones from His Amputated Leg! Taking inspiration from a friend who wears plastic bones for jewelry, one man took it the next level by designing an engagement ring with bones from his amputated leg! 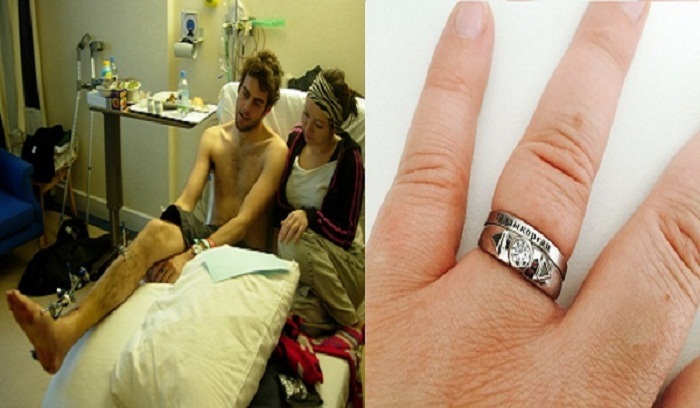 But before you freak out on this rather strange ring, you really have to check its cool design and the story behind the amputation – and you’ll surely change your mind. Set on a platinum band, the ring actually looks great – and you would not really suspect there were bones in the ring unless someone said so. The bone fragments are actually set inside triangles beside the quarter-carat diamond at the center. Plus, the bones were sterilized before they were placed in the ring by UK jeweler Ingle & Rhode. By giving his fiancée a ring embedded with his bones, Mike Perrett is essentially giving her a part of himself, quite literally! And it is quite symbolic because Melita had been there when Mike had his leg amputated. According to The DailyPedia, Mike had been volunteering in an orphanage in India back in 2006 when a freak accident led to him falling down a mountain. After he was told that the leg had to go, Mike requested doctors to give him, at least, part of that leg. So, he was given the shin bone. 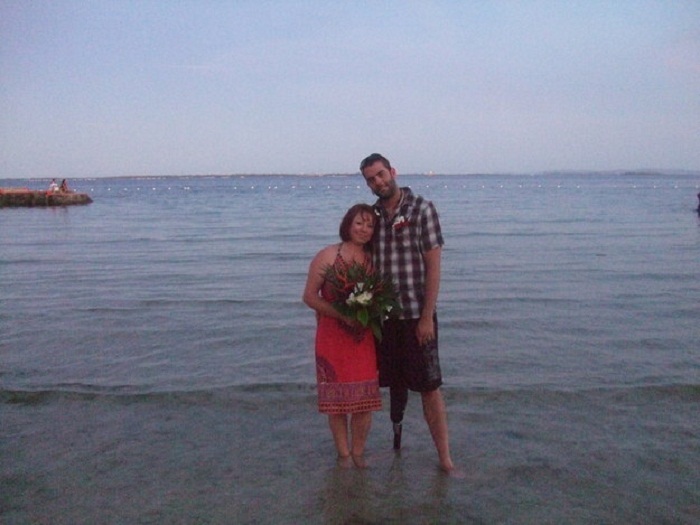 Melita had stuck with him through thick and thin – and through the amputation. So, it was but perfect that he would give her the bone-embedded ring. The two had since gotten married at a beach in the Philippines and are currently expecting their second child.